In my freezer I have a store of ready-to-wake pizza dough. That’s not ready-to-bake, by the way. Let me explain the difference. 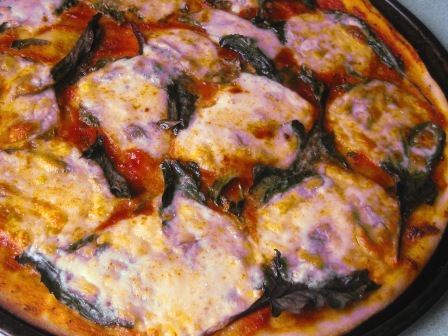 Ready-to-bake could mean a precooked pizza base that needs to be taken out the freezer, topped, and baked. You may have made it yourself (hopefully) but you may have stooped to purchase a ready-made pizza base. Yuk! Not in my house. Ready-to-wake means that I made some pizza dough, used some, and put the rest to sleep. Here’s how: Some weeks ago I opened up a 1kg bag of strong plain flour that is especially for breadmaking. I added olive oil, water, a little yeast and a smidge of salt, plus also some home-dried oregano, and made a big batch of pizza dough. After the usual big knead and rest, the dough spent most of the day rising. I then punched down the dough, kneaded it a bit more, then divided it into 7 equally sized lumps. I did that by using a one cup measure and squeezing in enough dough to fill it. I used 2 portions that day to make pizza. The remaining 5 dough portions were punched down and quickly slipped into airtight ziplock bags. I pushed out all the air from the bags and sealed them, then popped them to sleep in the freezer. Freezing the dough stops the yeast developing. Two days ago I took out a ziplock bag of dough and just placed it on the kitchen counter top. 24 hours later (it’s winter and very cold at the moment) the dough had fully woken and had doubled in size inside it’s little sleeping bag. Time to make pizza! I always make my own tomato sauce from scratch. Fresh vine-ripened tomatoes peeled and chopped and cooked down slowly for hours unattended with a little asafetida, cracked black peppercorns, olive oil, fresh basil leaves, fresh oregano leaves, fresh marjoram leaves, little salt and raw sugar. After the dough is fully awake I knead it and dredge it in a little flour and roll it to fit the pizza tray, which is slightly oiled. 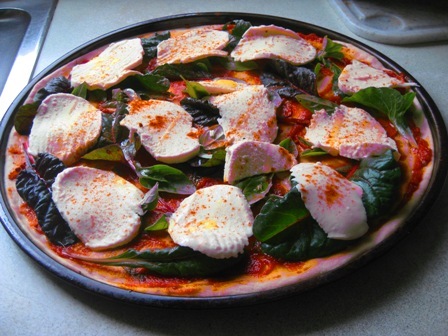 Today’s pizza topping is a simple one: after the sauce comes baby silverbeet leaves (swiss chard) and basil leaves from the garden, fresh mozzarella (I sliced three-quarters of a large ball that comes floating in whey) a sprinkle of cayenne and a splash of olive oil. Good enough to eat raw – almost. I decided not to add any other cheese for this pizza. 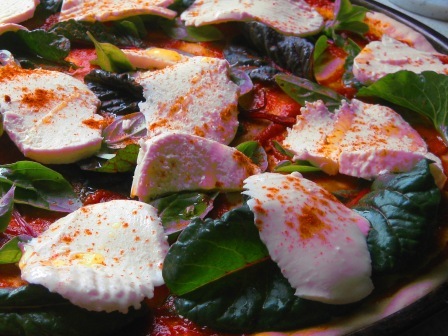 Fresh mozzarella melts beautifully and makes a very mild, mellow topping. Thin and crispy – buon appetito!